HomeA pauper, a poet, a swordsman, a nose – it’s “Cyrano”! A pauper, a poet, a swordsman, a nose – it’s “Cyrano”! What do you think of when you hear the name Cyrano de Bergerac? Perhaps you might first think of a protuberance entering well before the man. That name should bring to mind the classic story of unrequited love, mixed with humor, hijinks, and verse written by Edmond Rostand and first performed in 1897. Since then, numerous adaptations have sprung to life on stage and on screen, some with casts of hundreds, and others with casts of dozens. TheatreWorks is honored to present the California premiere of a cozy new adaptation of Rostand’s play translated by Michael Hollinger and adapted by Hollinger and Aaron Posner. This new version keeps all of the poetic beauty of the original and adds even more swordplay. The poetic beauty isn’t strictly metered, instead it ventures into modern prose that embraces the artistry of word play. The swordplay is normally limited to the battle between Cyrano and De Valvert in previous adaptations of the story. This time the swashbuckling is extended into battles that are not usually seen, such as when Cyrano singlehandedly defeats 100 men at Porte de Nesle. Robert Kelley directs this captivating premiere, working closely with fight director Jonathan Rider. Since swordplay is so integral to the action, it helps to have such a seasoned swordsman architecting those fights. Add to the cast Rider’s former college roommate Kit Wilder (De Valvert et al), an experienced fight director in his own right, and there’s an abundance of expertise not often seen in a single production. The show’s Cyrano (J. Anthony Crane) also has extensive experience with the sword, a must for this lead role. Rounding out the tight ensemble cast are: Sharon Rietkerk (Roxane et al), Chad Deverman (Christian et al), Michael Gene Sullivan (Le Bret et al), Peter James Meyers (De Guiche et al), Stephen Muterspaugh (Bellerose et al), Christopher Reber (Ragueneau et al), Darren Bridgett (Ligniere et al), and Monica Cappuccini (Desiree et al). Only Crane retains a single identity throughout the story. While the script calls for a minimum cast of nine including only one woman, Kelley chose to add a second woman to the cast to break out the roles along gender lines. Joe Ragey’s scenic design is sparse, yet fully on point with the requisite balcony claiming a prominent spot when needed. Beyond the balcony, various locations are suggested by smaller, abstract pieces and props that are quickly and easily moved into position. Drapes adorn the cyc adding an old world flavor. 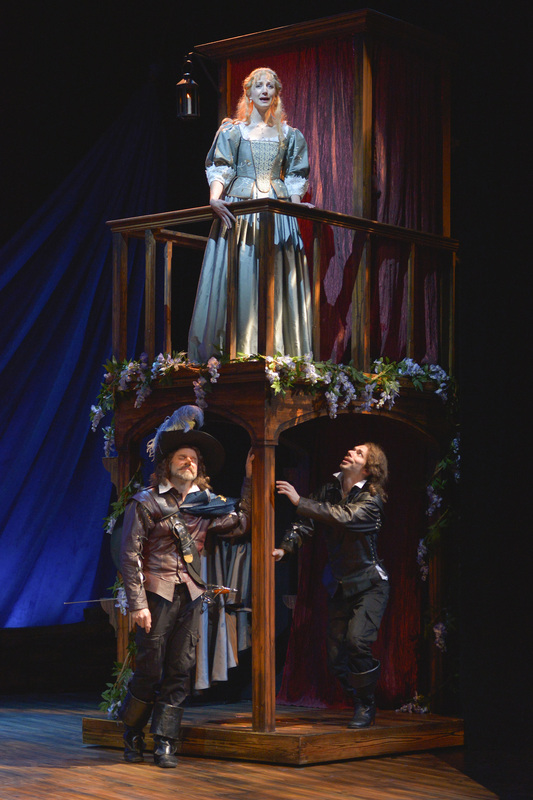 Preshow, a downstage drape serves as a title sign upon which the name “Cyrano” is projected. The show starts before curtain as various cast members saunter onstage, moving various props, costume racks, and other accoutrements around with them. They then proceed to change from modern street clothes into their character attire on stage. Fumiko Bielefeldt’s costume design is intriguing, combining elements of period dress with modern pieces. For most, the costumes break along the beltline with period leather doublets above paired with modern cargo pants below. The exceptions are the nobles as they need more adornments, so their costumes stay more period specific. Roxane also sports a mixture of period and modern appearance, but when in a dress, her modern elements are more hair related. When camouflaged as a soldier later in the show, she matches the other cadets in attire. The presentation flows fluidly, the pretty prose taking center stage from the start. Sullivan’s Le Bret is not only the captain of the Gascony Guard, he’s the narrator, ensuring that the audience understands the story unfolding amidst them. Throughout the story, characters enter and exit from all directions onstage and to and from the rear of the house. The interplay between the characters is rapid fire early on, and we don’t meet Cyrano until a few minutes into the story. 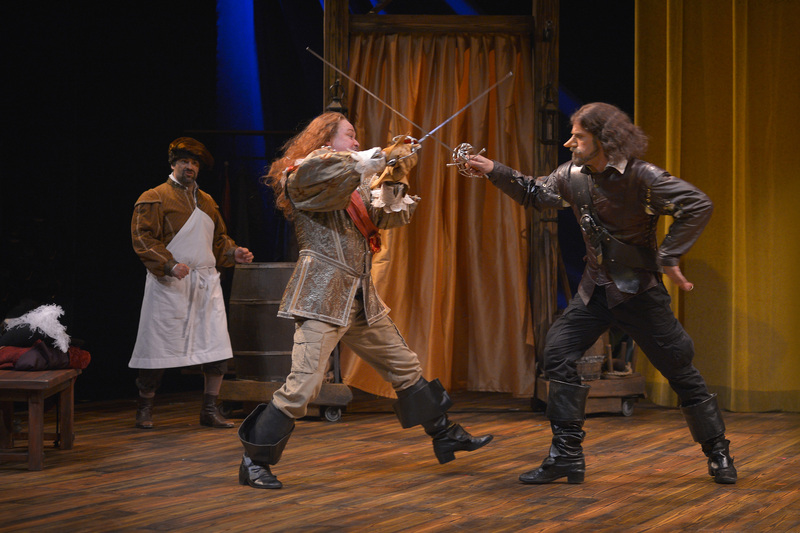 Once he enters, the confrontations commence, Cyrano making it clear that he fights with words as well as his sword. Crane and Wilder execute their duel with artistry, their movement telling a story beyond their swords as Cyrano shreds De Valvert in word and deed. The duel is a dance to the death executed with great finesse. The other big battle shown in the show is the Porte de Nesle massacre. The trick there is to have six actors play 100 opponents with quick changes and equally quick recoveries so the story never hangs. That speaks as much for the choreography as it does for the physical conditioning of each of the actors. Here too a story is told with each kill, some of it quite comedic. Later, the siege of Arras is implied, but the battle (save for a few explosions) is not directly shown. The fighting style in the show isn’t what you’d see in an Errol Flynn swashbuckling/fencing spectacle where blades clash faster than the eye can follow for ten minutes at a time. Instead, the swordplay in Cyrano is truer to the period it depicts. The clothes and the swords were heavy. It was harder to move and took great strength and stamina to wield the blades. Each strike had to be carefully placed, and hand-to-hand moves were often coupled with the strikes. Crane is exquisite as Cyrano, from his prose delivery to his tenderness both with Rietkerk and with Deverman. In a nice touch, he also accompanies himself on guitar at appropriate moments in the story, first making a splash with the catchy “Gascony Guard Song” rallying his fellow guardsmen together, and later when he serenades Roxane with “Behold the Bee”. Deverman slightly overplays Christian’s awkwardness with Roxane, but that only intensifies the contrast to Cyrano’s silver tongue. Likewise, Rietkerk accentuates both Roxane’s strengths and her flaws. She captures Roxane’s humor, lithely sparring with suitors galore. Roxane is simultaneously intelligent and gullible, fooled by Cyrano’s ruse to ply her with his artist’s soul through his words and Christian’s face, and Rietkerk handles this dichotomy with ease. The famed balcony scene when Cyrano pushes Christian out of the way to bare his soul to his beloved under cover of darkness is brilliant. Crane and Rietkerk banter playfully while Deverman contorts out of Roxane’s sight, displaying his longing to the house. A while later, when Deverman scampers up the trellis for his long awaited kiss, it’s Crane’s Cyrano who contorts below, both satisfied that he succeeded in his heart, and dismayed that this would likely be as close as he’d ever get. The action slows down after Christian and Roxane consummate their relationship, but the story continues. The final scene has a sense of dread permeating the mood, though there is still a touch of humor at play. The prose is beautiful, forcefully delivered, and all in attendance finally understand the true score. This is a delightful production that is appropriate for all ages. He’s a poet, a swordsman, a nose – he’s Cyrano! 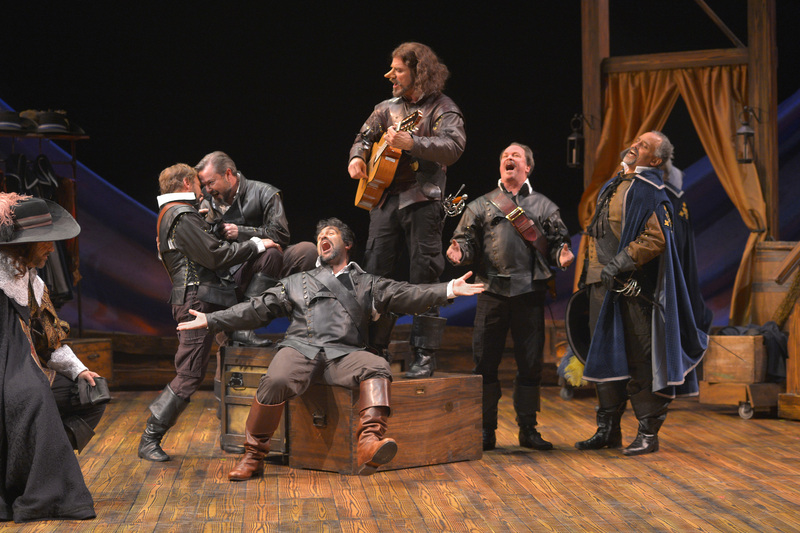 See http://www.theatreworks.org/shows/1516-season/cyrano, email boxoffice@theatreworks.org, or call (650)463-1960 for more information or to order tickets.